Recently professionally converted to a very high standard. Two further upholstered travelling seats. Cushion flooring. 2 x External windows including internal blind/fly screen. LPG gas box. Underslung waste water tank. Immaculate and in as new condition throughout. Many extras including Automatic gearbox, new 2.4 eco diesel, alloy wheels, leather front seats. Factory fitted tow bar. Driver and passenger side windows UVA film protected. Volkswagen VW Campervan T6 Transporter, 2016, New conversion, Sportline styling. *FINANCE IS AVAILABLE* at a low fixed rate of 4.49%!!! Chris Apperley - Visit us for a test drive - Call us on 441164029083 or click here to find out more. 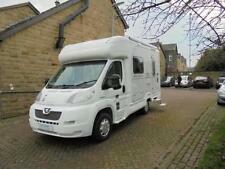 A low mileage very spacious 2 berth motorhome in excellent condition. (Further details will follow). Lunar Landstar EW. 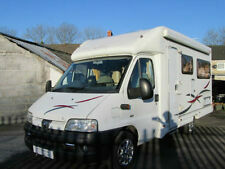 Refillable underslung LPG tank/ 120 watts solar panels/160 amp leisure battery/ 19000 miles with full service history. 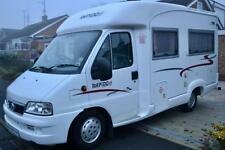 2 Berth with Gas/ Electric blow air heating and hot water/ LED lighting/ 3 ring hob with oven/grill and microwave /3 way fridge/ good storage and 2 tables. The Swift Bolero 612 has two front side facing settee which slide together to make a large double bed, at the rear of the Bolero 612 there is a well equipped kitchen which includes a full oven/grill and a hob with 3 gas burners and a hot plate. Multi-pointed to allow sleeping in Single, Twin format or even Small Double King Size or Super King - just add or detract a panel as and when required. Still under Citroen Manufacturers warranty until November 2019.